LONDON — A new study of fertility treatment found that women who get three or more embryos have no better odds of having a baby than those who get just two embryos. 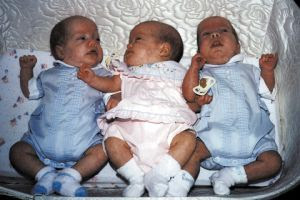 They also have a greater chance of risky multiple births. "Women who have gone through infertility treatment want the best chance of having a baby, but we need to explain that the data shows transferring more embryos doesn't actually do that," said Dr. Scott Nelson, head of reproductive and maternal medicine at the University of Glasgow, who co-authored the study published in Thursday's issue of Lancet. For women over 40, the live birth rate was 13 percent whether they had two or three embryos transferred.